After the Onetouch Premier League 2007-2008, playmaker Kofi Abanga won the prestigious “Discovery of the Year” award. Before the season, in July 2007, Abanga had been involved in a high-profile transfer saga between Hearts of Oak SC and Asante Kotoko FC, finally deciding to leave Aduana Stars FC to join the former. After showing such promise, Abanga’s career has unfortunately taken a turn for the worse. A serious knee injury put Abanga on the sidelines during the GLO Premier League 2010-2011 and most parts of the GLO Premier League 2011-2012. On 30.12.2012, Abanga made his first appearance of the current season. He looked sharp and I think it is to early to write him off. Abanga is a skillful central midfielder with good vision and almost telepathic passing. He can play in a holding midfield role or as a traditional playmaker, dictating the flow of the game. I have previously written that Abanga is born 12.02.1988 (source: Transfermarkt) but according to the official homepage of Hearts of Oak SC, Abanga is born two days earlier, on 10.02.1988. The picture is of Abanga and was found on dailyguideghana.com. As far as I know, James Abban started his career in Tamale, playing for second level side Lepo Stars. Tamale is a large town in the Northern Region of Ghana. In 2007, Lepo Stars changed their name to Guan United SC. The GLO Premier League 2009-2010 became Abban’s breakthrough season. Abban had travelled south to join the newly promoted Great Olympics from Accra, the Ghanaian capital. Although Great Olympics suffered relegation at the end of the season, Abban scored regularly. I can document that Abban scored six goals during the season but it is likely that he scored eight or nine goals. Abban performances had not gone unnoticed. He was picked up by the ambitious Wa All Stars FC but struggled in front of goal. After only a half season, Abban travelled back south and joined Liberty Professionals FC. He failed to score during the second part of the GLO Premier League 2010-2011 but excelled during the first part of the following season, scoring six goals in 12 matches. This impressive ratio earned Abban a big move to Hearts of Oak SC, making his debut on 19.02.2012. 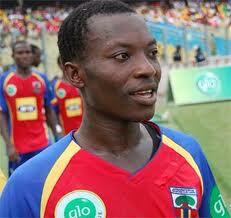 At the time of writing, Abban has only scored one goal during 19 matches for the Phobians. Abban has mainly been used as a substitute. It seems likely that Abban will join a new club during the up-coming transfer window. I have seen Abban play several times. Abban has an impressive work ethic, often using the entire pitch, roaming freely in search for goalscoring opportunities. At times, his finishing is poor and this is a quality he has to improve. Abban is quite powerful and rather tall. When he gets to run a couple of meters, he is very fast. His size and pace, combined with his hard work, makes him difficult to defend against. I have previously written that Abban is born 31.07.1988, based on a registration document from the GLO Premier League 2009-2010. However, when Abban participated for Ghana in the “Universiade 2011” in Shenzhen, China, 31.07.1991 was published as his birthdate. His full name is “James Kwame Abban”. Hearts of Oak SC made a smart move when they signed left-sided midfielder Thomas Abbey from second level side Windy Professionals FC. Abbey showed a lot of quality during the first part of the GLO Premier League 2011-2012. Unfortunately, he lost the second part of season through injury. Abbey is very comfortable on the ball, has a lot of energy and a lot of confidence, making him an attacking weapon when he races down the flanks or orchestrates moves from a more central position. For the last year, Abbey has been a regular participant in various training sessions for the Black Satellites, the Ghana U-20 national football team. At the time of writing, Thomas Abbey has played a total of 18 matches for Hearts of Oak SC. He has yet to score his first goal for the Phobians. His full name is “Thomas Arnold Abbey”.